Text & Photographs By Daniel Roessler © All rights reserved. When most people think of a trip to Hawaii images of beautiful beaches and crashing waves come to mind. That was what I expected when I visited the island of Kauai for the first time a few years ago. I had already spent several days in Maui snorkeling and expected Kauai would be more of the same. My second morning on the island, I drove north from my hotel in Wailua. When the road ended at Kee beach I got out to take a look around and discovered that there was a hiking trail called the Kalalau Trail that began there. I was not prepared for a hike but had a bottle of water with me, so I decided to at least walk a short distance up the trail. At the time I did not realize, that I had begun the greatest hike of my life. I headed up the steep incline along a winding path. The lush tropical vegetation hung over the red-dirt trail in numerous places. As I rounded the corner where the trail protruded out over the ocean, I stopped in my tracks with my senses overwhelmed. First, directly in front of me was the beautiful and untouched Na Pali Coast. The jutting, chiseled form of the lush green is to this day one of the most beautiful natural settings I have ever seen. The mountainous coastline appeared to go on forever and a gray mist floated above it. Then, I peered out over the ocean below. The pearl blue water was so clear that even from the mountain, I could see the outlines of the coral reefs. When I turned around, I was also able to see the beach from which I had started glistening in the sun. There were several more twists and turns with similar views before the trail steeply descended on to a beautiful white sand beach, I now know is called Hanakapiai. A stream flowed out across the beach dividing it into sections. I sat and rested in the shade of some of the trees along the stream. The day had started heating up, so I drank most of my remaining water. I knew I should turn around and head back because of my lack of preparedness, but after talking with some folks, I realized that about two miles away was a waterfall that fed into the stream. I decided this was a once in a lifetime opportunity that I wasn't going to miss, so I located the trail on the far side of the stream and headed toward the falls. Even in the hot mid-day, the trail that ran along the stream was covered over by trees and heavy vegetation that kept it cool. As I neared the falls, crisscrossing the stream, I caught a few previews and heard the roaring grow louder like it was cheering me on. The falls poured down into a deep emerald colored pool. The area was covered in shade and looked like paradise. I finished off my little remaining water and took photographs before heading back. The hike from the fall back to the beach was not too difficult. However, as soon as I left the beach headed up the steep incline that had been relatively easy as a descent, the pain in my calves started to take hold. It was the hottest part of the day, and without any water I knew I was in for a tough afternoon. The hike back was physical torture, and I was more fatigued than I think I have ever been. However, I kept turning around and taking in the view of the Na Pali coast. I smiled knowing that it was worth the pain. When I finally arrived back at my car, I was drained. A nearby park not far from the start of the trail had a vendor selling drinks. I bought several and tried to hydrate. Reading material after the hike, I discovered that my hike was about eight miles round trip. 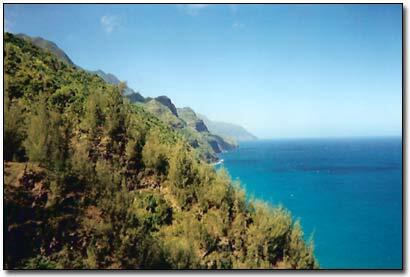 The Kalalau Trail actually extends into the Na Pali coast another nine miles, but permits are required. The extended hike is for experienced hikers who come prepared with their supplies. 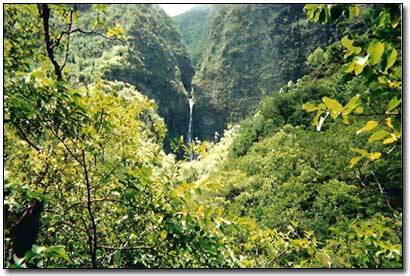 I hope to one-day make that trip; because as I discovered, Kauai is more than beautiful beaches, it is a place where spontaneous hikes can provide the thrill of a lifetime.